Preparing InDesign Files for Translation | Language Solutions Inc. The task of Preparing InDesign Files for Translation is always a good investment. It makes the Translation and Typesetting process a lot smoother if files are setup correctly for translation. Designers who are interested in learning more about this process should read our overview of the most common steps in Getting your InDesign Translation Ready. In this blog we are going to look at a recent translation project that had a great impact on typesetting. We’ll use the example of a brochure that was designed using a baseline grid. As a designer you may never want to approach brochure design this way. But it’s a good example to illustrate how how design decisions like these can impact the translation process. Grid layouts are great for making content fit perfectly uniform across many pages. Text is locked to the baseline grid with uniform leading values. Grids are typically used to design text heavy books where you want the same lines to fall on the same place on each page. When text can freely flow across pages, even in translation, we should not have too much trouble with grids. However, grid layouts are typically always bad for translation when we talk about design pieces where text is bound to specific margins. Grids are designed to override leading values, which makes the layout very rigid. That’s why we typically don’t grids in brochures because of the many design elements. The example on the left has two columns with the same leading values set to each text style. 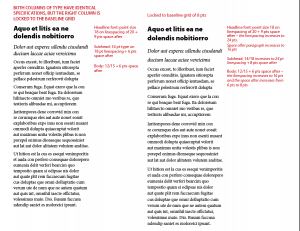 However in the right column, InDesign has the text set on a baseline grid of 8 points. The baseline grid overrides the style specification. This means that each line “jumps” to the nearest grid line, which in this example is distributed in 8 point increments. To illustrate another issue with grid lines, we set the original style of the subhead to be non-divisible by 8 (the size of the baseline grid). As you can see in the example, this forces a 14 point type subhead to look terribly uneven. In the English design this may be corrected, but it may become a problem in translation as we’ll explain further. Typesetting translation in InDesign is a task of “making things fit the original design.” Translated text is never going to be the same length as English. Typically it goes over or under by 10 – 20%. This means that order to fit the same text on a page, you need to manipulate the font and line spacing. Say, our earlier example we’ll need to reduce point size by a half and the line spacing by one point. We can only do that by cutting the baseline grid down to a lower point size. We could, for instance choose a 6pt. baseline so that we have more flexibility in layout. However, when you set up a 6 point baseline, you also need to set up all your styles to be divisible by 6. This includes headlines, bullet points and also any additional spaces that may have been added in to the English. Otherwise, you may have oddities in your line spacing such as the subhead in this example. Working with a smaller baseline grid may work for several pages, but it is unlikely it will look great everywhere. What if we don’t optimize this file for translation first? Brochures typically are only designed to work well for that particular layout in English. Fitting translated text in a grid layout basically becomes a new design job. The only way to make translation work in grids is to adjust the baseline settings to make most of the copy work and copy edit the translation to make it fit. Typically in translation, we don’t have the flexibility to edit the text from its original English meaning. Just think of the headaches to get these edits approved in brand compliance! This would mean we would have to provide back translation of the text, have it approved by the client and then it needs to be made fit. If anything is not approved, we go through more rounds of editing until we get it to fit. Our Translation Memory software allows us to work directly in InDesign files. Translation will automatically flow back into InDesign so for our typesetters to work with. When we prepare these InDesign files for translation, we look at how we can optimize the English design file so that the translation will flow in fairly predictable way. One typical example where designs run into trouble is in headlines or subheads. These are typically written and designed in a way so that they can fit on one line with very little margin. These design elements almost always drop to the next line. If you didn’t design the brochure to take into account how InDesign treats the spacing for that second line, you’ll need to adjust that everywhere in translation. For this brochure, we had to entirely re-set the English text in InDesign and take out the baseline grid. This can be a time consuming effort because now we need to define styles that are consistent with the original design. Basically, we are approaching the layout of the InDesign file in an entirely new way. This also means that if styles were not set up correctly in the first place, that work gets added to the job. The tasks of neatly defining styles for each text type is a common process when we prepare InDesign files for translation. The time investment is worth it though. Once translation is ready to flow into InDesign using our Translation Memory software, we have a reasonable expectation on how it is going to flow. It also allows us to focus on typesetting expertise rather than needing to rely on language experts to solve design issues. Need help with typesetting translation in InDesign?